Most of you need to put images and attach files (PDF, Word doc, etc.) in your email. We used to tell people to take their files and upload them to www.dropbox.com or your own server and then come back to MSA and link to that file or image. No longer! Now you never have to leave MSA and we host your files and images on our secure content servers for use in email. Just click a button, select your file or image and it's displayed or linked to your message. Note: This first release supports email messages only. Please let us know if you have any issues or questions. We will be rolling out this feature for all your form messages and your directory home and mobile messages in the coming weeks. Issues? If the message window doesn't appear when you first try out this feature, please refresh your browser. You'll then be prompted for the name of your link. Use text that encourages the reader to click on the link. You can style as a text link or you can display as a button. Either way, when the reader clicks they will be opening your file. In addition to the file and image insert, we also have a new feature to add buttons to your message. 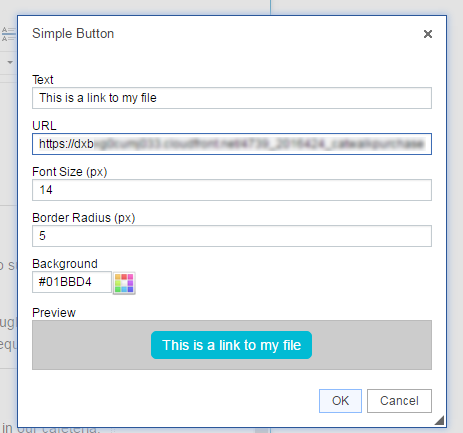 This feature allows you to create your own buttons as well as style the button automatically created for you when you add a link and choose the Insert Button option. To style your button click on the new button icon in the Editor toolbar and change the text and color. If your button was created by the Insert File option, DO NOT remove the URL as this is the link to your file! Otherwise, you can add any URL you wish to link to.